Last Friday was the first anniversary of Rod Blagojevich’s historic ousting from the Illinois’ governor’s seat. Like many state newspapers, Lee Enterprises unveiled a story on Blagojevich’s legacy last week that dealt with his lingering presence in the Capitol. We included a timeline of Blagojevich’s life with the story, and I suggested we make it interactive. My bureau chief liked the idea and we used a site called xTimeline.com to make an interactive timeline. It was easy as pie to create, and two newspapers linked to it inside the Blagojevich legacy story. They were the Quad-City Times and the Journal Gazette Times-Courier. As far as I’m aware, this was the first multimedia supplement that the Lee Enterprise Springfield bureau has created. It’s simple but effective. And personally I would rather look at an interactive timeline than a simple list of events. That was the alternative, of course. Hopefully this is a sign of things to come. I would love to help bump up the level of multimedia content that comes out of the Springfield bureau. Of course, writing will be the focus all session. But every once in a while, multimedia supplements–like timelines, graphs and maps–really help make the story (or sidebar) pop. I think this Blagojevich timeline is a good example of this. 1. In the 19th Congressional District, incumbent John Shimkus faces his first primary opponent in 14 years. That is quite an impressive run. Veterinarian Mike Firsching of Moro is hoping to do the unpredictable and unseat Shimkus for the first time since he was elected. However, Shimkus is severely out-fundraising him. According to federal records released last week, Shimkus has raised $211,000 between October and mid-January. Firsching hasn’t raised close to that, only saying he’s pitched in $3,000 of his own money. Firsching said he ran, in part, because he believes the federal government has too much power. He pointed to the Department of Education as an example and said Washington shouldn’t be control of local school districts. As a student of the Constitution for the past four years, he said he would vote against proposals that expand the government’s powers beyond those laid out in the Constitution. He also cited dysfunction in Congress and a lack of personal freedoms as reasons for running against Shimkus in the southern Illinois district. 2. In the 18th Congressional District, incumbent Aaron Schock does not face a primary candidate. So instead, I covered the Democratic race, which features Deirdre “DK” Hirner of Springfield and Carl Ray of Washington. While the election could be interesting, the winner will likely have an uphill battle because the central Illinois district hasn’t elected a Democrat for more than 90 years. Think about that for a second: 90 years! Wow. Now that is a strongly GOP district. Hirner was critical of Schock for voting against the stimulus package, health care legislation and the Lilly Ledbetter Fair Play Act, which gives workers more time to take cases concerning pay discrimination to court. “The 18th district deserves someone who will work for them in Washington,” she said. Ray was upset Schock voted against the State Children’s Health Insurance Program, known as SCHIP, which provides federal matching funds to states for health care coverage of children. The measure was vetoed by President George W. Bush twice, although it eventually passed and later was expanded by President Obama. In fact, Schock’s “no” vote was the tipping point for Ray to enter the race. He said the vote hit home because he has an autistic son. He was born around the same time his wife became very sick, which raised the cost of health care for the family. And that is it for this election update. Expect coverage from these races and more as the election nears. And remember, get out the vote (in just a week)! SPRINGFIELD — Drivers in Illinois would only be required to have only one license plate on their vehicle, under legislation pending in the Illinois House. The proposed law would require drivers to have one license plate in the rear of their vehicle, changing the current law that requires license plates in both the front and back of a registered vehicle. State Rep. Jerry Mitchell, R-Sterling, said he is sponsoring the measure because it would save the state $1 million a year. While this is by no means a big story, it’s still pretty cool to see my article printed in the newspaper. This is, by far, the largest newspaper I’ve been published in. I have a feeling they will run a few of our articles during the spring legislative session, but it will have to be on subjects they aren’t covering…It should be interesting to see how involved they get. Here’s hoping for the best! It should be no surprise that the Illinois GOP has been overflowing with excitement after Scott Brown’s unlikely victory in Massachusetts. The state, after all, hasn’t elected a Republican to Senate for more than 35 years. Here in Illinois, many candidates and party affiliates are hoping the seating of Brown will signal a national Democratic dethroning come November. As a result, the list of local GOPers lining up to congratulate Brown grew long last night as the election results came in. Mark Kirk, a candidate for U.S. Senate, for instance, used the opportunity to solicit supporters. Fellow Senate candidate Patrick Hughes tweeted about the victory, as did Bill Brady and Jim Ryan, candidates for governor. Republicans Kirk Dillard and Dan Proft went a step further and extended their congratulations in an official statement. Illinois Republican Party Chairman Pat Brady did as well, proclaiming loud and clear that “Illinois is next.” My bureau chief, consequently, wrote a story on the press release, as many media outlets did. It adds a more personal touch, I guess. If you recall the movie Ground Hog day, Bill Murray had to relive that day over and over again until he got his life right. Are we going to continue to relive the past here Illinois by electing the same corrupt, self serving, or unprincipled politicians? Or are we finally going to elect a principled servant of the people, who will go to Washington and defend the Constitution and move us past the reliving of Ground Hog day? Groundhog Day, by the way, is two words, not three. But all kidding aside, what the hell? I’m not going to embed the second ad because it’s very similar to the one above. But here is the link. SPOILER ALERT: It deals with “monkey business” in Illinois! A. Elections, elections, elections. With the state in fiscal peril, everybody is looking to the state’s leaders and hoping–and praying–for swift and meaningful action. And with the lawmakers out of town until the election season is finished, it’s no wonder why the primaries are dominating Statehouse coverage as of late. I had a chance to cover some of the lesser-know races last week and the stories appeared in various newspapers over the weekend. And I am happy to report that I received one phone call today regarding my treasurer and comptroller stories that ran in the Herald & Review, which means at least one person is reading them. SPRINGFIELD — The candidates for Illinois lieutenant governor may be vying for a position with few formal responsibilities, but that hasn’t stopped a trio of them from putting hundreds of thousands of dollars into the race. Democratic hopeful Scott Cohen has loaned his campaign more than a half million dollars so far this month. Republicans Don Tracy and Jason Plummer are tapping into their own wallets and into their family businesses for cash to bankroll their primary ambitions. And the link. It will be interesting to see how people react to this story. Some are sympathetic to self-funded candidates and wish it didn’t cost nearly that much to run a viable campaign. But others think it’s ludicrous to spend that much money on a campaign and wish the money would go a better cause, like a charity. If you have an opinion, leave it in the comments. B. Secondly, I had three election stories run this weekend in our fine Lee Enterprise publications on the comptroller and treasurer races. Each of the three stories dealt with a particular primary race, including the Democratic race for comptroller and treasurer, and the Republican race for comptroller. In the Republican race for treasurer, Sen. Dan Rutherford, R-Chenoa, is running uncontested in the primary, so there was no need for a story. Basically the question posed to the candidates (eight in all) was: What is your opinion of short-term borrowing? In recent years, the state has made it an annual practice to borrow money, which is usually reimbursed in a year or so, to help pay its bills short-term. Recipients of the borrowed money include human service providers, medical providers and universities. The issue became volatile this year after Gov. Pat Quinn proposed borrowing $500 million to help pay Medicaid bills and other providers. Comptroller Dan Hynes refused to sign off on the plan. Hynes, of course, is running against Quinn in the Democratic gubernatorial race. Quinn cried foul, saying Hynes was playing politics and human service providers were suffering as a result. Hynes said the state simply has too many unpaid bills as it is. Recent estimates put Illinois’ backlog of bills at $5.1 billion. That’s billion with a “B.” Both the treasurer and comptroller have to sign off on all short-term borrowing plans (although the General Assembly did consider a proposal last week that would have allowed the state to borrow money without getting approval from Hynes. The measure, however, wasn’t debated on the Senate floor). Look for more election related stories in the coming weeks. And remember, folks, get out the vote on Feb. 2! As I mentioned yesterday, the scene at the Capitol was a bit crazy after Gov. Pat Quinn’s State of the State address on Wednesday. Reporters were scrambling to talk to rank-and-file lawmakers before they left town and candidates in the February primaries were trying everything they could to get their mug on TV. And many lawmakers had similar complaints about Quinn’s speech: it was too vague. That didn’t surprise me that much. But what did surprise me was how many people used the phrase “elephant in the room” to the describe the state’s mounting fiscal crisis. In particular, many lawmakers were upset Quinn didn’t make the “elephant in the room” a focal point of his speech. One lawmaker, in fact, counted the number of minutes it took Quinn to mention it. He said it took roughly 47 minutes. State Sen. David Luechtefeld, R-Okawville, said it will be interesting to see how much emphasis Quinn places on the dismal state budget. The deficit is expected to reach $12 billion by the end of the fiscal year. “It’s the elephant in the room,” Luechtefeld said. 2. The quote was picked up by radio stations and newspapers, including the Alton Daily News. 3. 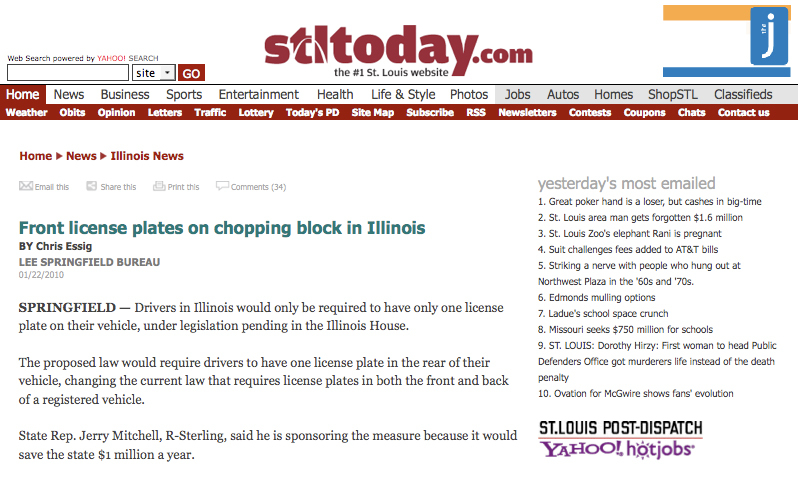 Illinois Statehouse News also used the phrase in a headline. “The longer we continue to ignore the elephant in the room that is a thirteen billion dollar deficit, the more destructive it becomes,” said [State Representative Jil Tracy (R-Mt. Sterling)]. “We did do some work this year, and I think the governor spent a lot of time talking about those things, but the most important thing is the elephant in the room, we have to get a budget passed,” said Jehan Gordon, D-Peoria. 6. I also saw the phrase used in the comment section of a story posted on Capitol Fax. It was not until nearly 50 minutes into the speech, however, that he addressed what some lawmakers call the “elephant in the room” — the dismal condition of state finances. 8. And, finally, I heard the phrase on my way to work today being used by Kevan Kavanaugh, president of Mid-West Family Broadcasting, in his daily editorial. He was also critical of Quinn for not addressing the “elephant in the room” sooner and with more force. Dismal budgets continue to be the elephant in the room in most statehouses, but lawmakers are still making time to address other issues as well. Have you seen the phrase pop up anywhere else?